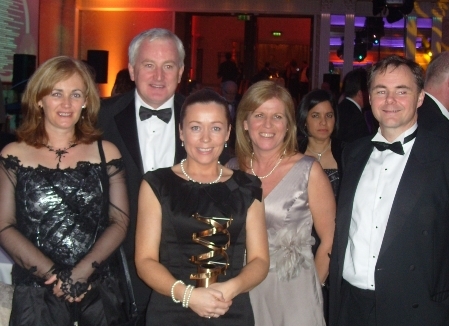 Congratulations to Niamh Mc Cormack from the Chronic Obstructive Pulmonary Disease (COPD) Outreach Programme team, who won the Irish Medical Times Healthcare Award in the category of "Nursing Project of the Year" for An Assessment of the Impact of a Respiratory Passport for Patients with COPD. The award was granted at a dinner on October 15th. The "Respiratory Passport" teaches a patient how to better manage their COPD and provides a personal "Action Plan" for use at times of particular difficulty. The aim is to reduce detrimental exacerbations of COPD and thus reduce the number of hospital admissions. A recent study has proven that the "passport" also is a strong empowerment tool. It helps patients control their illness and feel more autonomous, improving their sense of wellbeing and increasing their confidence. Each "passport" action plan is customised for the patient and includes information about exacerbation symptom recognition, pharmacological management, chest clearance, smoking cessation, diet, vaccination, and exercise. If the patient does present to the Emergency Department, the "passport" gives hospital staff a record of the patient's current treatment and therapy information. The "passport" is used in tandem with the COPD Outreach Programme's services and is provided to all assisted discharge and pulmonary rehabilitation patients. Dierdre Long, Respiratory Nurse Specialist; and Richard Costello, Consultant in Respiratory Medicine.